We are already preparing for this year’s sport shooting event, the 3rd Annual Davidson Cares Clay Day! This year’s event will directly benefit St. Augustine Youth Services (SAYS), Take Stock in Children and Five Learning Years (FLY). The services these organizations provide are vital to Northeast Florida’s children. We want to give more information about each charity to let Clay Day participants know exactly where their contributions are going. This month, we’re focusing on SAYS. SAYS is a non-profit organization that offers services to children in need and provides a safe, therapeutic environment for boys who have suffered from severe abuse and neglect. Many of the kids they help are referred by the Department of Children & Families or other welfare agencies. SAYS was established in 1989 and has helped thousands of First Coast kids. In 2017 alone, the organization served 800 youth in St. Johns, Flagler, Volusia and Putnam counties! SAYS programs are broad and far-reaching, including therapeutic group homes/pre-independent living group home, Mobile Crisis Response Team, Transitional Life Coaching and Targeted Case Management to assist children and their families. How is SAYS continuing to develop its services for kids? 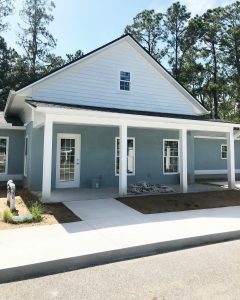 SAYS is working hard to complete its 4th therapeutic home on the SAYS Hutson Family Campus, which will provide care to an additional 12-17 children annually. The house is very near completion and will be open sometime in September. SAYS has raised about $400,000 of their $600,000 goal to fund the home’s construction. They also plan to launch a new community program in St. Johns County known as the CAT Team (Community Action Team), which is an effective alternative to out-of-home placement for children with serious behavioral health conditions. In addition to participating in Clay Day, how can people help SAYS? They always accept donations (funding and everyday supplies). SAYS is currently in need of school supplies, backpacks, tablets and gift cards. Visit https://www.sayskids.org/donate-1for more information. Visit DavidsonCares.comto register or pay by cash or check at one of Davidson Realty’s offices in World Golf Village (100 E. Town Place, St. Augustine) and Jacksonville Beach (1500 Beach Boulevard, Suite 215).